Pet Poo Skiddoo is Now Composting Dog Waste! Currently there are more then 80 million dogs in the U.S., each one depositing an average of 275 lbs of waste annually. That’s a staggering 22 billion lbs of poop per year – most of which is placed in plastic bags and thrown into the landfill. We’re here to change that. You’ve heard of “reuse, renew, recycle”? The same can be applied to dog waste. The process is quite simple as nature takes care of most of the work. To compost, combine a specific ratio of nitrogen-based material (such as vegetable scraps, grass clippings… and dog poop) with carbon-based material (such as straw, leaves, and wood chips). Over time, the two components will come together and form a humus, organic matter that is rich in nutrients; Apply to the ground to enhance the soil’s ability to grow healthy, more resilient plants. 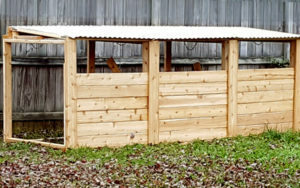 There are a few more precautions to take when composting dog waste compared to vegetation as dog waste can contain a multitude of unwanted pathogens; It needs to be more contained, of a certain minimum volume, and reach high enough temperatures to kill off harmful bacteria (a reason why we do not recommend composting small amounts of dog waste in your backyard). We have chosen to purchase equipment from Green Mountain Technologies, a company in Bainbridge Island, WA that offers a wide range of composting solutions for small-scale operations to large enterprises. 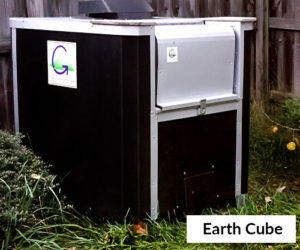 The composter we are using for testing purposes is their simplest unit they’ve named the Earth Cube, a compact, in-vessel composter that can handle 25 lbs of waste per day. The in-vessel feature means that it is completely enclosed – containing odors, keeping animals and bugs out, and preventing unwanted bacteria from seeping into the soil. We’ve also been building 3-bin wooden structures that will be used to house the compost for several months while it cures after its initial time in the Earth Cube. Around 6 acres of land has been purchased in a secluded area outside of Asheville. A landing has been cleared and construction is planned to be completed this spring. We are still in a testing phase to make sure we get our formula just right. Currently we are composting about 175 lbs per week, that’s over 700 lbs of dog poop saved from the landfill each month! 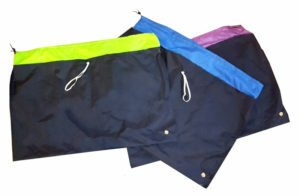 We are now switching over to reusable bags for collecting dog waste. Say each scooper used 20 plastic bags per day. That’s 120 plastic bags for a 6 day week, over 6,000 plastic bags per year! And that’s not including the larger black bags that are used to consolidate the waste before being taken to the landfill. By using the new washable nylon bags, we are not only dramatically decreasing our plastic footprint, but getting one step closer to our goal of avoiding landfills altogether!